Why we have three Mazda MX-5s! Over the last 18 months, I’ve caught the MX-5 bug and taken to the track. The MX-5 thing started when Mum and I went off to Milcars Mazda, Watford, the local Mazda dealership, to choose a Mazda 6 estate to replace our Mazda CX-5. Adorning the showroom floor was a 1999 Mk 2 MX-5 10th Anniversary Edition in sparkling Innocent Blue with only 6,500 miles on the clock.. Mum and I took a liking to it. A deal was done and an estate and a sports car joined the Pollard stable. 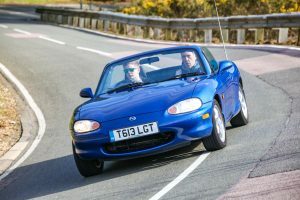 The exorbitant cost of insurance meant that I rarely got to drive the first MX-5 – a couple of times on the Alpine Circuit at Millbrook and a car control day at Rockingham. It didn’t prove too hard to persuade Dad to flog his rather conservative VW Golf and invest in a Mk3 MX-5 2.0 Sport. 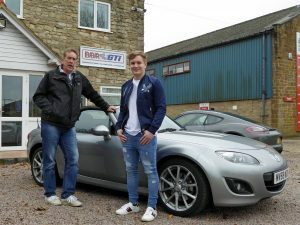 A Super 200 upgrade at the excellent BBR GTI, the leading tuner of MX-5, was arranged. The Super 200 adds a worthwhile 47 bhp & 26 lb.ft of torque through a high flow panel air filter, a stainless steel 4 into 1 exhaust manifold, high performance intake and exhaust camshafts, a BBR StarChip ECU remap and Koni suspension. 2016 say my debut on a track day. 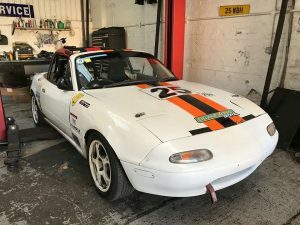 The track of choice was Bedford Autodrome, the ideal beginners track – nice wide track and plenty of run off for those moments when you think you’re better than you are. 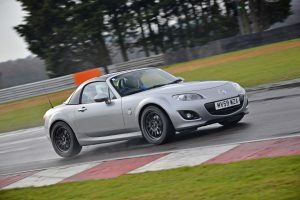 Regular attendance at Bedford in the BBR MX-5 was a great way to develop my skills. Lap times started to come down… from 3mins 25 secs on my debut as a raw novice to 2 mins 50secs on my latest visit. Dad’s ability to change a set of brake pads also improved…. Snetterton featured, plus a great day at Spa in Belgium and a Friday track day and Sunday Mazda Sprint Series at Anglesey on an extended visit in August. With my eyes set on a step up from track days in 2018, we started looking around for a competition that would be a good choice for a novice racer and wouldn’t require a crippling budget. (If you’re thinking of following my lead, bear in mind that motorsport isn’t cheap; if you’re looking for cheap, then stick to cycling). The BRSCC Mazda MX-5 Championship was the one I went for…. which meant the acquisition of a third MX-5 into the Pollard Mazda family, a Mark 1 to almost complete the set. I just need to convince Mum that a Mark 4 MX-5 RF would be a better choice than a Mazda 6 Estate. Better get her down to Milcars Mazda again…. Find out about Getting Started – my beginner’s guide to going racing – and the car that I’m going to be racing in 2018.